Top prices for commercial metal accounts plus free containers and hauling! Binford Metals pays top prices for commercial metal accounts with all containers and hauling provided at no cost to you. 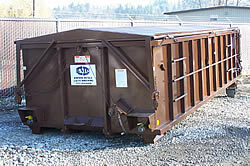 We have uniform containers ranging in capacity of 1 to 40 yards that are well maintained for usability and appearance. For machine turnings, we offer sealed containers with lids and drains to prevent storm water pollution. Binford can remit payment next day, next week or with the next scheduled pick-up. Just let us know how we can best serve your needs. For price quotes or further information regarding services please contact our office at (253) 854-8000 or e-mail one of our representatives below.